One of our pals was claiming that he had not eaten any authentic Cantonese style Claypot rice since his 1st trip in Hong Kong and during the our last dinner of the trip, we had finally visited a place in Yau Ma Tei to ease all cravings. 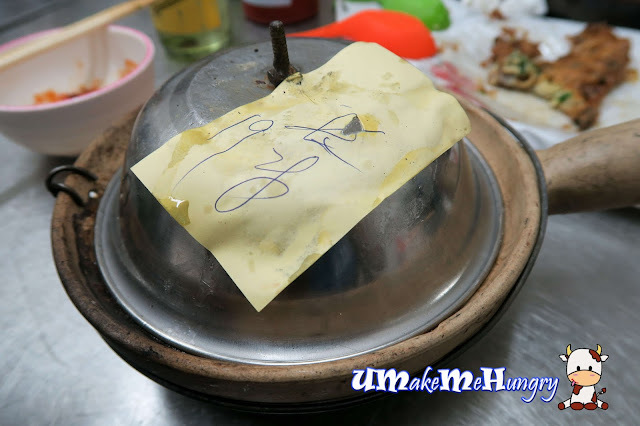 To be frank, I have never tasted Claypot rice in Hong Kong too, yes! Not even once in any of my trips. Our search lead us to Temple Street and just like a typical night street, the place was filled of make-shift stalls selling clothing and all kinds of apparatus. 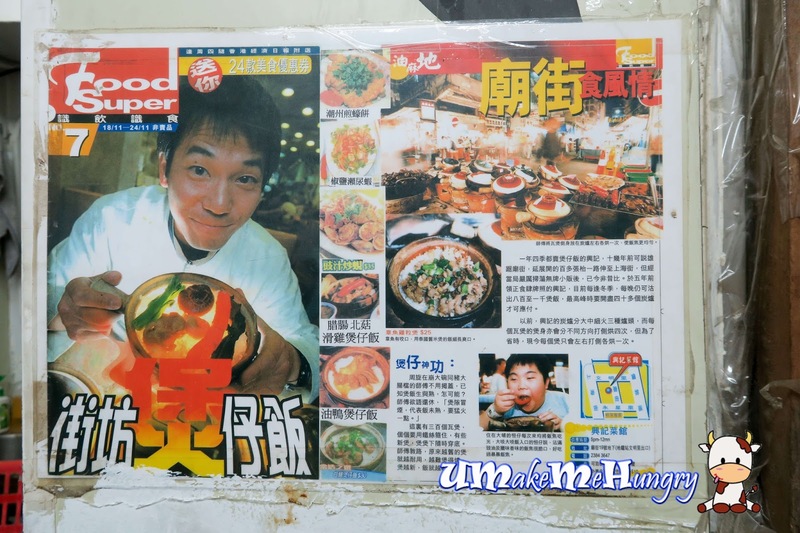 There were large posters near the shop to warn patrons against their imposers. In fact, competition was very fierce as the servers next door came to us and tout, trying to mislead us into their restaurant and even told us they are of the same. Unscrupulous! 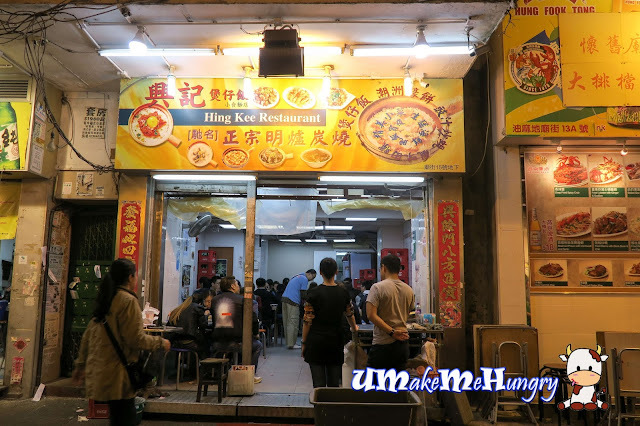 Luckily we were told by other patrons that they were not the authentic and we went ahead with Hing Kee Staff and there she brought us to the entrance near the back alley and walking up into a frail wooden stairways that I felt may collapse any time. Hing Kee's Claypot Rice popularity is evident as they have a few shops and it was fully packed. I could not have imagine that there were about 20 more patrons in that squeezy and rundown dining area. Cartons of food ingredients were stacked leaning against the wall and movements was limited in such way that our back is at close proximity to the wall or the back of the patron. Given this in Singapore, I would say such setup will never be approved by SCDF. Besides claypot rice, they are also serving other Chinese cook dishes. 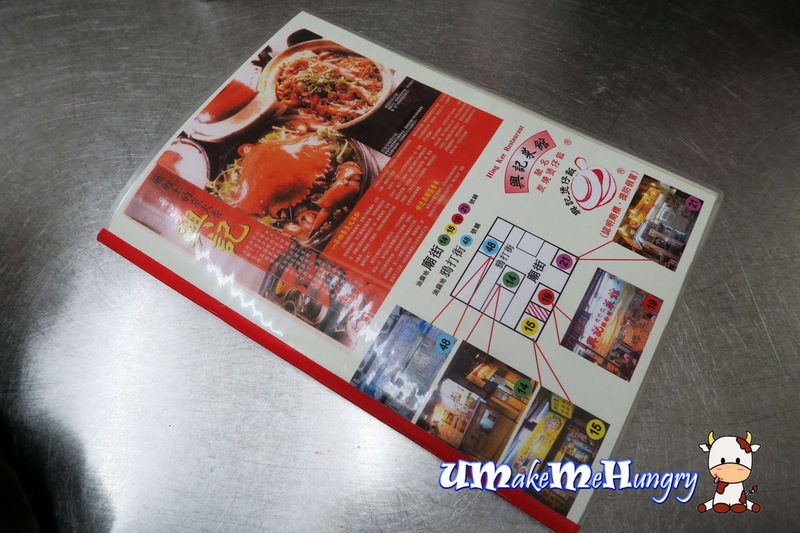 Menu contains 3 languages, Mandarin, English and Japanese. Aisles were narrow and I felt my life was at their mercy - Beware of service crew carrying big trays of hot and heavy claypot swinging above your head if you were sitting at the aisles just like me. Another stunning scenario that you will probably not see in Singapore was that these service crews actually placed their whole tray of scalding hot claypot on the floor while waiting for the other crew to distribute around. I wonder what will happen if NEA see this in Singapore? While waiting for the pot of rice to be ready we had these oysters cake to fill our stomachs. Though a layer of grease paper was placed at the bottom to adsorb the excess oil, before the oil can be fully absorbed by that piece of paper, they were already down into our hungry stomachs. 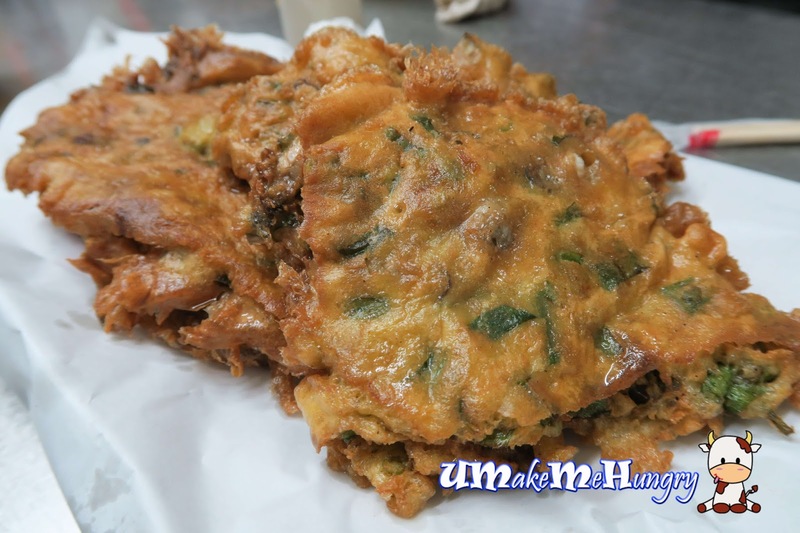 Forget about the additional calories as these fried oyster cake were worth all, just eat. The ratio of egg and batter used was well proportion and with ingredients like prawns, spring onions and of course oysters. Oyster cake comes in small and big sizes with the smaller ones cost 35 HKD. They were very crispy and if you love oysters, they were quite generous on the servings. Finally, after about 20-30 minutes of wait, the charcoal cooked clay pot rice was served! Each serving was small and good for sharing between 1-2 pax. The knob-less stainless steel cover was removed, revealing the plain rice with pieces of chicken and chinese style sausage. This is the most authentic flavour of the claypot rice.Though under the charcoal fire, their chicken remain tender and juicy. As for the sausage, it was crunchy and with juices spurting out once you bite on them. To obtain a better claypot rice eating experience, we placed in the desire amount of dark sauce and give them a good consistency taste by stirring. We could not find any more dishes more appropriate to order but at least ordering the greens will kind of make us feel healthier. 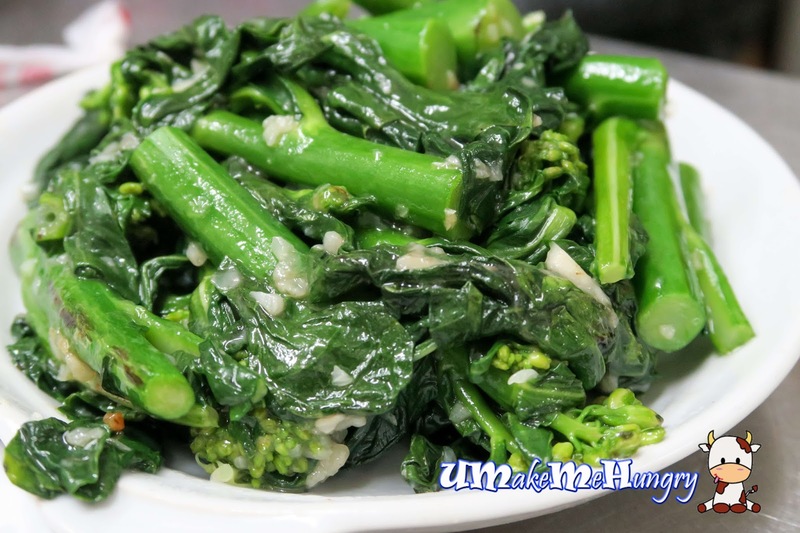 These healthier choice were simply stirred fried with minced garlic and were perfect pairing to the pot of rices with its crunchy stems. 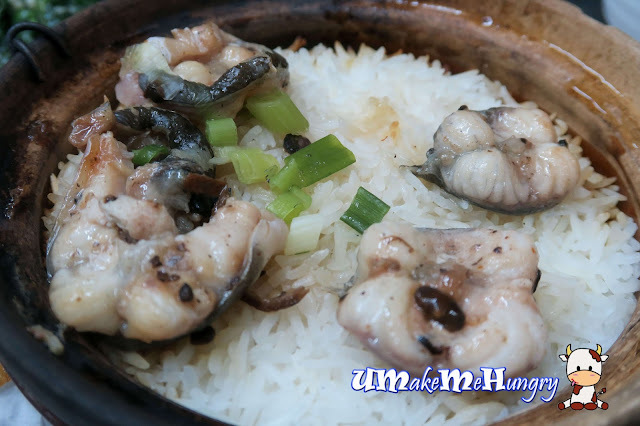 With so many of us ordering chicken and sausage claypot rice, I decided to be more adventurous and ordered something out of the ordinary - The Eel claypot rice. It was kind of disappointing with a few pieces of eel and whole pot of rice. Just too boring and wrong choice for me. When we done with our dinner and down via the narrow stairways, we had a peep into the kitchen. I was speechless by their way of preparation the oyster cake that we had earlier. 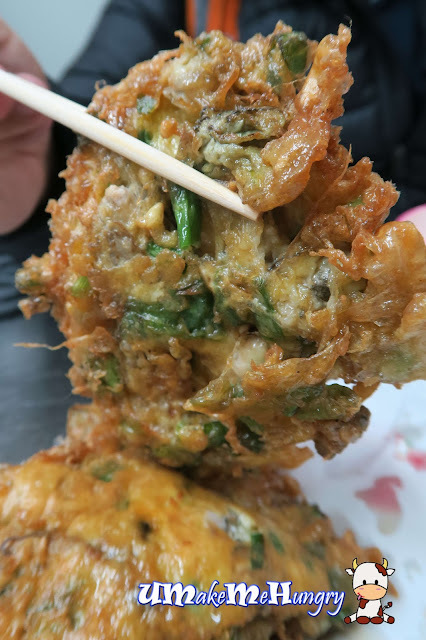 It was sinfully deep fried and for any healthy souls who caught this sight could most probably feel discomfort by the amount of oil used. Also just by standing there for about 1 minute you will already feel like a walking oyster cake with all the oil mist clinging onto the clothing. Afterall, it was a good experience for me as we seldom get to see this happening in Singapore. As a whole experience, their rice was skillfully cooked and hearty. However, I'm still not very use to the Cantonese Style of Claypot Rice and find it an average fare. I prefer the few popular ones back home instead.